i got flowers at work today. pink tulips. the delivery guy walked into the shop carrying them and the ladies i was working with pointed me out to him when he asked... and still when he looked at me and said my name i said "who? me?". and then i had to sign a piece of paper, which i guess i did poorly because i was still so surprised. monday was the 24th annual Helen Hayes Awards. for non-DC folks, you can think of this 2 ways... the DC equivalent of the Tonys. 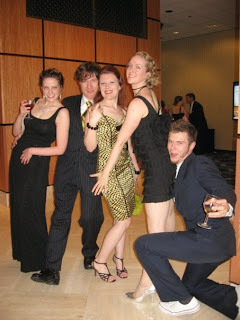 or theatre prom. it is a little of both. the highlight of the awards portion of the evening was that Reefer Madness (which i designed last july) was nominated for 6 awards. it won 2 of them! Outstanding Director, Resident Musical and it took the biggie it was nominated for... Outstanding Resident Musical. the party was loads of fun... as captured in the picture (taken by my gal pal Meghan). yes, i know... shock of all shocks, i wore yellow! i was going to go with a long black evening gown, but it was pouring rain all day and i was not interested in mopping the streets of downtown DC. dress was a happy accident... as was my 1960s hairstyle. oh, and ps... i have the most attractive friends ever. it was all good. i stayed the right amount of time. i had the perfect number of drinks. i saw and hugged at least 80% of the people i wanted to see and hug. my date was awesome. i liked my dress. and i got to sleep in on tuesday! i didn't even have to be at work until 3pm. all of these = great time. i am back in tech. i am working on #4 out of 5 in the big spring tour de force that is my working life. come mid may i am going to pass out for an entire week. during that week or break, i will only work at the shop. and clean my apartment top to bottom. and sleep. and knit. i have some crafty news. 1. i bought the yarn and needles to begin the baptism shawl for my future niece/nephew. this is a project jess knows i am making, so i am cool with sharing the details. we shall see if pictures go up. can't decide if i want to try to surprise her a little. 2. i knit a few rows on the cashmere scarf because it is simple an di could do it in a very dim theatre. 3. i knit a few rounds on the gathered pullover because i can knit that in complete darkness. 4. the cross stitch project i am currently working on is a warm-up to something bigger. the current is a set of very small (and too cute) winnie the pooh characters that will be for the new person's room. i have pooh, piglet, and eeyore finished. i started tigger and i will probably get him done by the end of the week. i need to learn how to make better french knots so i can really finish each of them (they need knots for eyes) and frame them for hanging. they are moving right along, however! i think i will keep the bigger project a secret for now. i hurt myself pretty badly at rehearsal last night. i even had to fill out accident report forms. i slipped in a puddle of water and fell into a chair sideways. my backside and lower back are nice and stiff and my shoulder/neck/arm are all manner of screwed up. boo. advil is my friend. but beer actually makes it feel best. 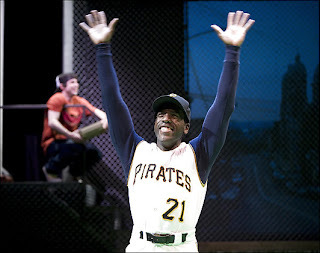 last weekend i opened a brand spanking new musical: Looking for Roberto Clemente. i loved working on this show. i love watching it. i adore the cast. the design is adorable, and the message of the piece is fantastic. but, hey... don't listen to me, go read the washington post review. theye even have two pictures. yay! click on the "next" button in the frame and you cn see the second one. if you want a better view of all of my design, take a look at the short video Imagination Stage put out to promote the show. 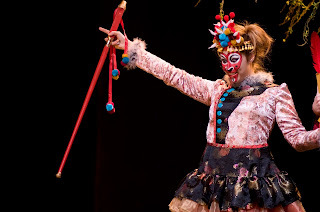 go see some children's theatre. it may surprise you! cast: Zack Colonna, JP Illarramendi, Derek Manson, Don Mason, Erika Rose, Matthew Schleigh, and Chris Wilson. Roberto was a pretty amazing human being. 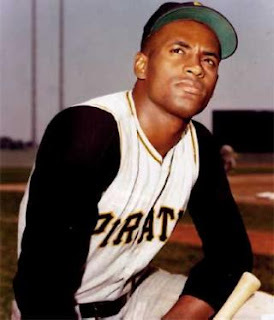 Read a bit about him, and i am sure you will see why some call him the last true sports hero. 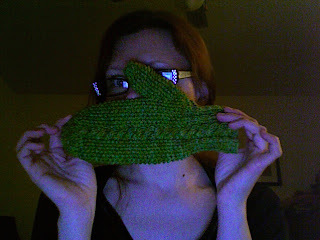 the picture is a mitten i finished a few weeks ago. i just like it and wanted to share. it doesn't have a mate yet. boo on me. i'm going to talk about myself for a bit. there aren't really rules for the blogging i do here, so hang in there with me while i have some me time. life has been super crazy, and i have felt much more like a worker bee than a person for the last 4-6 weeks. so i went out and got a little indulgent to help make me feel a little more like a person. my idea of "indulgent" is laughable, but i am on an artist's budget, you know. ahh, cotton knit. how i love thee. i hit target this week and got myself some new shirts on sale. 1 black tee, 1 black tank, 2 (very acidic happy!) green tees, and a new skully shirt. i think the last time i bought myself new clothes was back in october or november, and it is starting to show. i really need new jeans, but with the weather finally turning and my skirts looking longingly up at me from my drawer, i may be able to put that off until the fall clothing urge hits again. new black tees make it that much easier to resist the temptation. that and the fact that trying to simultaneously be a woman who feels good about herself and try on jeans is a near impossible feat, i think i will save the heroics for the future. my real splurge was a few new books. that's right, i am reading again. i started out by icking up Tropic of Cancer again, and i have made some progress this time around. i had to put it back on hold lately because my head has been too full for a stream of consciousness frolic through Paris that utterly lacks a plot. instead have been reading the copy of High Fidelity that rW gave me. he was going to lend me his copy and instead surprised me with my very own. i love the film, so it is safe to say the gift will get well used in my "rereading" cycles. it is a fast read, and it is very fun to see the differences between the book (set in london) and the movie (americanized and set in chicago). the books i got myself. i picked up a copy of Breakfast at Tiffany's because i was inspired by gwen. i bought the compact hardback for a few bucks more because there are 3 other Capote short stories in that edition. i am warming up for when i finally let myself read In Cold Blood. i know i can't do it until i am low stress enough not to get all worked up by the violent and horrible parts. new knitting/crochet book! i bought a sock book.... Stitch Style Socks. i don't actually own any sock books. all of my socks have been knit from free patterns or books that contain all variety of patterns. i have just never found one that is overall special enough to make me want to buy it. this one grabbed me with the cover project--houndstooth check socks. there are also some neat slippers, a pair of chunky cabled leg warmers, and knee-high skull socks. lots of fair isle and intarsia in this book, which are two techniques i want to get into more. Dictator Style: Lifestyles of the World's Most Colorful Despots. this one is pure fun for designer. it is gross, opulent, and over the top. it seems sick to want to see pictures and read about Nicolae Ceausescu's bathroom or Manuel Noriega's christmas tree, but it takes design and mindless fun to a whole new level for me. plus, sometimes you just need something to be outraged about. i never update my blog. or knit. but i do get some sleep and i am trying to read a book when i can. i am not the lamest person in the world yet. at least the washington post gave me some love. oh, and my mom. she loves me too. at least she still says it even though i have been a bad daughter and not been calling her daily in the past couple of weeks. sketch i last posted. fun, huh? see, my lameness has a good cause behind it. ps- there were other (mostly) good reviews for the show, but i am not feeling in much of a gilding the lily mood. i am happy with the work, as are my colleagues. that is enough.